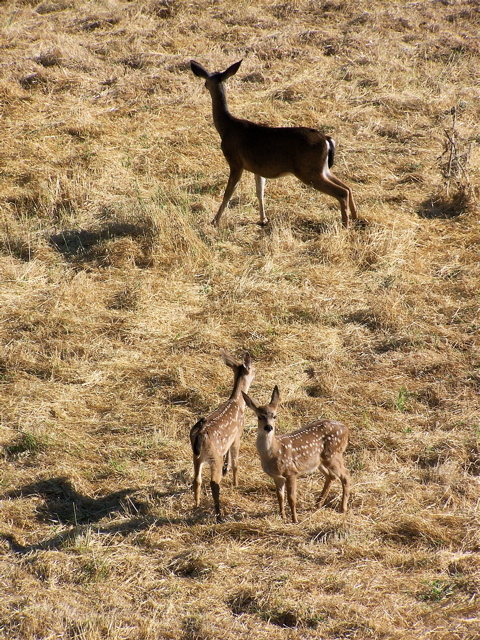 A blacktail doe and her two fawns in my field. 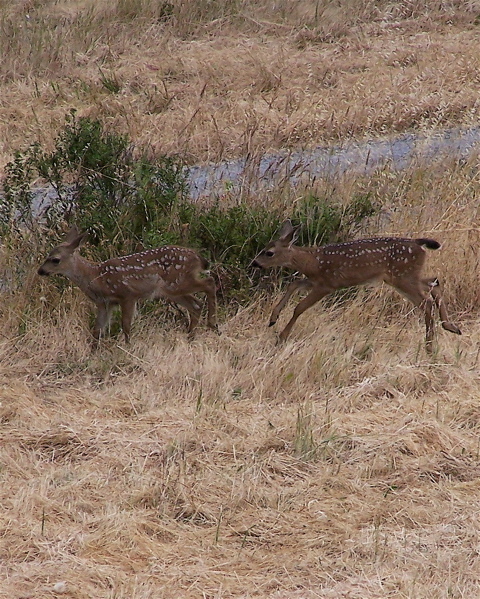 Fawns at play bound across my field. Now that Independence Day is over, let’s take a moment to reflect on what it was really all about. Footraces in Inverness? Parades in Woodacre and Bolinas? 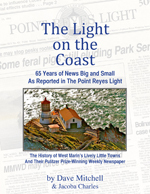 A tug of war between Bolinas and Stinson Beach? Illegal fireworks on Stinson Beach? I myself spent much of the holiday enjoying nature. The odd thing about the Fourth of July is what it doesn’t represent. For example, did the 13 colonies begin their fight for independence from the British crown on July 4, 1776? No, the “shot heard ‘round the world” — at the opening battle of the Revolutionary War — had already been fired on April 19, 1775, in Concord, Massachusetts. Paul Revere had made his famous ride the previous night. On April 23, 1775, King George III had declared the colonies to be in open rebellion. The colonists had seized Fort Ticonderoga from the British on May 11, 1775, and on June 16, 1775, had fought the Battle of Bunker Hill. In short, the American Revolution had been underway for a year when on June 7, 1776, representatives of the 13 colonies — meeting in Philadelphia as the Continental Congress — began debating whether to declare independence from the Kingdom of Great Britain. On July 2, all the colonies except New York (which abstained) voted to approve a draft of the Declaration of Independence. On July 4, 1776, members of the Continental Congress (with New York as usual abstaining) voted to approve a final draft of the Declaration of Independence, but only John Hancock, president of the Congress, signed it before it was sent to a printer. The document we know as the Declaration of Independence was signed by all members of the Continental Congress, including New York, on Aug. 2, 1776, and backdated to July 4. Perhaps one reason we don’t celebrate Independence Day on Aug. 2 is that those who signed the document on Aug. 2 did so in secret to avoid British reprisals. I personally would have thought that keeping the public in the dark negated the purpose of a “Declaration” of Independence. 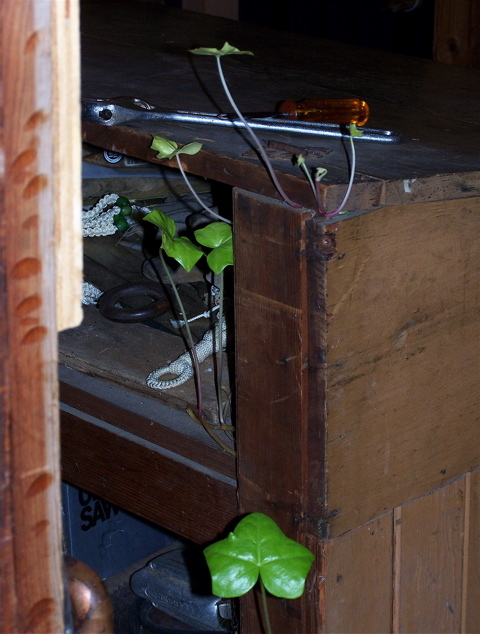 Likewise in the dark and fighting for survival: this dauntless vine of ivy has worked its way through a narrow gap in the wall into my basement, where it is now growing up through a cabinet in my workshop. Because there are no windows in the workshop, the vine gets light only when the basement door is briefly open, as it is here, or when the sun is in a position where there may occasionally be a crack of dim light around the door. The photo demonstrates the valiant persistence of ivy, but it also reveals why many homeowners don’t want it growing on the outside walls. Sparsely Sage and Timely is powered by	WordPress 4.9.10 and delivered to you in 0.327 seconds using 52 queries.